Trying to find directions to our facility? We are conveniently located 15 minutes from just about anywhere in the Greater Richmond Metropolitan area. Just enter your starting address and click the button below. Your directions will open in a new window. Or, you can enter the address below into Google, Waze or Apple maps using your Android or iOS (eg IPhone) device. 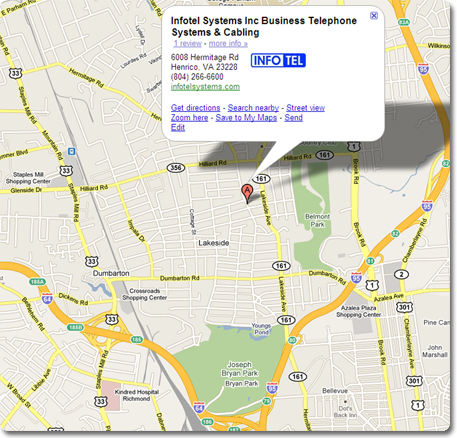 Infotel Systems is located directly adjacent to Verizon on Hermitage Road in the Lakeside area of Henrico, Virginia. We are within walking distance of Hermitage Grocery and HOBNOB. If you pass either of those while traveling south on Hermitage Road you have gone too far. Most questions or problems can be resolved over the phone or remotely. If you wish to visit us in person, please feel free to stop by between the hours of 8AM and 5PM, Monday – Friday. We are closed on the weekends and all major holidays, but in case of an emergency don’t hesitate to call us at (804) 266-6600. Your business is extremely important to us. Please make sure you leave a message and someone will get back in touch with you as soon as possible. Our service area includes: Richmond, Henrico, Glen Allen, Chesterfield, Cumberland, Charles City, Goochland, Louisa, Fluvanna, Doswell, Powhatan, Ashland, Chester, Colonial Heights, Hopewell, Petersburg, Lynchburg, Fredericksburg, Farmville, Chantilly, Alexandria, Newport News, Norfolk, Williamsburg, Hampton Rhodes, Virginia Beach, and Washington D.C.